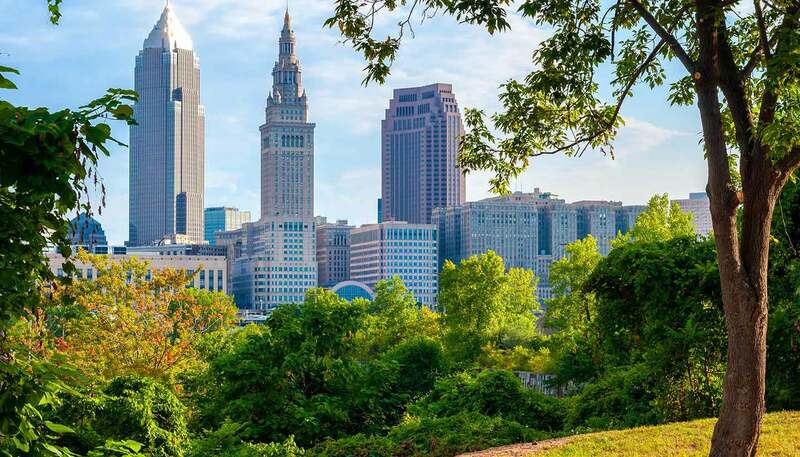 Gritty, no-nonsense, and unassuming it may be, but Cleveland has grown beyond its blue-collar image as an industrial hub, to become a vibrant and ethnically diverse metropolis. It may not have the glamorously hip image of some other American cities, and is widely seen as a place where people watch sports, drink beer, and listen to classic rock. But while there are touches of such character in this city on the southern shores of Lake Erie, look closer and you'll find surprising elements of art and natural beauty. Visitors are often taken aback to discover the vibrant downtown with its characterful neighbourhoods and lively atmosphere. Cleveland has been rejuvenated in the past few decades, and become something of a model for modern urban planning. Downtown is the centre of things, with historic Public Square - a European-style plaza with statues and fountains - its focal point. The lakefront is home to the stunning Rock and Roll Hall of Fame and Museum, which epitomises the city's growing cultural presence. One less obvious legacy of Cleveland's industrial wealth is the treasure trove of cultural establishments and institutions, from the Playhouse Square Center (the second-largest performing arts centre in the USA) and the Cleveland Museum of Art. Downtown areas such as the Theater District, the Historic Warehouse District, the Flats Entertainment District and the Historic Gateway District, are just a few of the trendy spots that continue to attract businesses and residents alike. And a more recent addition to Downtown is the Great Lakes Science Center and the Cleveland Clinic OMNIMAX Theater. There are all the ethnic restaurants and shops you would expect to find in any big modern city, but Cleveland is especially blessed with a strong Polish community, and the Polish food served here is among the best in the country. There are also large Italian and Irish populations, as well as Czech and Slovenian communities, all of which add their own personal flavours into the culinary and cultural mixing bowl that makes up this proud city.